Shortly after we found out that my tummy has a new inhabitant I set out to find some good reading on the subject of pregnancy. At a time when your whole body is reorganizing itself in miraculous ways to provide for a new, albeit temporary, inhabitant (or parasite, if you wish ;)) it’s good to know what’s going on and what to expect! To be honest, one of the first emotions I felt after finding out that I was pregnant was (a slight) freaking out. It doesn’t matter that we want to have a baby and had been planning for this – the realization that it’s actually happening was just pure scary. Think about it, you’re suddenly completely responsible for another human being. And a lot of the things that you do have a direct impact on the development, health, and well-being of that little person even if at that moment its only the size of a peanut. The first couple of books that I turned to didn’t help me to overcome that feeling, quite the opposite. 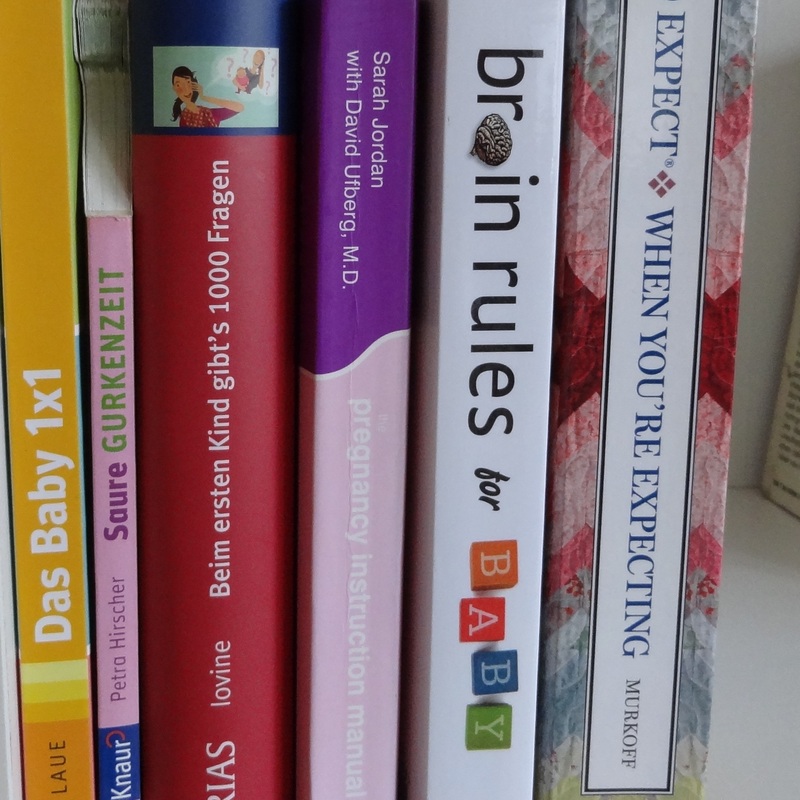 Do you have any idea how much guilt-tripping some pregnancy books can cause? Didn’t take any folic acid in those first weeks when you didn’t even know you’re pregnant? Its deficiency can cause birth defects of the brain and the spinal cord. Eating the wrong stuff during pregnancy? You may be messing up your child’s metabolism for the rest of their life. And aside from all the things that you should do or should have done months ago, do you really want to know about all the possible things that can go wrong? (trust me, its a long list) Needless to say I was feeling overwhelmed. Now in my fifth month of pregnancy I can go back to those books and read them without raising my stress levels. But let me recommend you two books that helped me through the anxiety valley that is the first trimester. The best book to start with – it has all the important information in a beautifully condensed form that includes tips, lists, and awesomely drawn figures that no proper instruction manual could do without. Whenever I have a question this is the first book that I turn to as I know that I’ll find what I need without being overwhelmed and it’s a fun read. I have the German translation of this book, it was a gift from a friend who thought I could use something funny after I complained about the guilt-tripping troubles some other books were causing. Trust me, this is the perfect antidote. Its hilarious and covers most topics from the viewpoint of an extremely honest friend who has no reservations whatsoever to talk about all the dirty little details that come with pregnancy and childbirth. That said, this book needs to be taken with a grain of salt: after all it is just the opinions (and rants) of one woman that you don’t need to agree with and your own experience of the whole process may turn out to be quite different.